So early this morning, I was in my studio, boxing up new stuff (OMG will it never end) and heard on chat (shout out to FCC), ‘anybody letter m?’ ‘ME!’ I said, and immediately was teleported to a lovely store, the Crimson Shadow. I won the most lovely dress – Midnight Blue Rose Dress. I have to say, not my typical style – I wondered where I would wear such a thing. Then decided I didn’t care, I’d wear it to the grocery store, just to wear it. Later in the morning, my pal Vox Repine of Chroma completed his new sets of 3d eyes. He sent me the red ones. Um no. Green, I asked? He sent me green and blue! I’ve not changed my eyes since I started in SL – so it was time for a change. I LOVE THEM. Don’t know why I didn’t do this sooner. Then I remembered – the dress! I dug an old Calla style outta my inventory, Wisteria by Haedon Quine, now of Tousled, which I have always loved and then my lovely victorian boots from the Laughing Academy and ta-da! I may wear this for a few days. Oh though I normally wear green eyes, I went for the glacial blue, as I’ve always thought that black hair and blue eyes is the hottest combo…Credits for all below the pictures. Hair – Calla Wisteria Darks (Black) – No longer available. Change is good, drama in lapis lazuli is better! Change is inevitable. As it was a given that I would grow increasingly tired of my own freebies, causing me to make a crop of new ones (visit the shop or onrez/slex!! ), it was also a given that I would grow tired of my sign boards. I have been for some time. I also finally decided to give in and start making my pieces in other metals – typically I’ve been doing silver or gold. So the good news is that I’ve redesigned my sign boards. The bad news is that I’ve redesigned my signboards, forcing me to go through the tedious process of updating everything in the shop. Since this will take some time, I’m going to do it gradually. I’m also going to update all of my pieces in Silver, Gold and Copper. So expect to find new stuff in the store as my older pieces become available in these new metals. In the meantime this week, I have a new release! I call it Lapis Lazuli Drama. 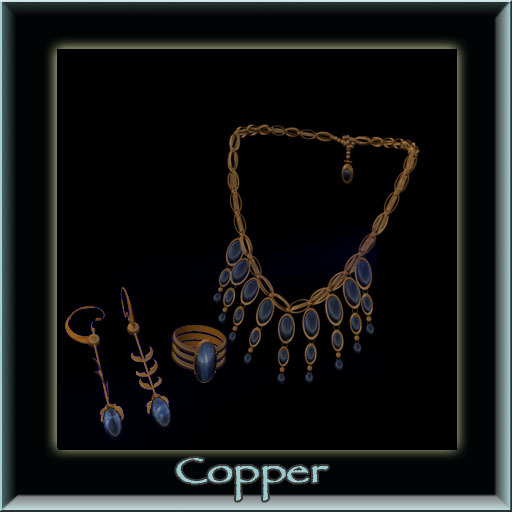 It’s a dramatic draped necklace with a beautiful lapis stone in either gold, silver or copper (see! change is good). It comes with a pair of stunning organic earrings and a beautiful cocktail ring. It came out quite lovely and is another statement piece. Also – I’m still plugging along in the shoe department (funny how the world comes full circle, my first job in life was as a sales clerk in a shoe department). While I struggle with sculpties, and watch the feed for the lovely displays of shoe goodness and talent, I do continue to make shoes. Usually in a combination of sculpty and regular prims. I made a pair of chunky sandals, which I think are quite nice, and which I will probably re-texture into a variety of colors – but since I simply have no time this week, they will be my dollarbie of the week! 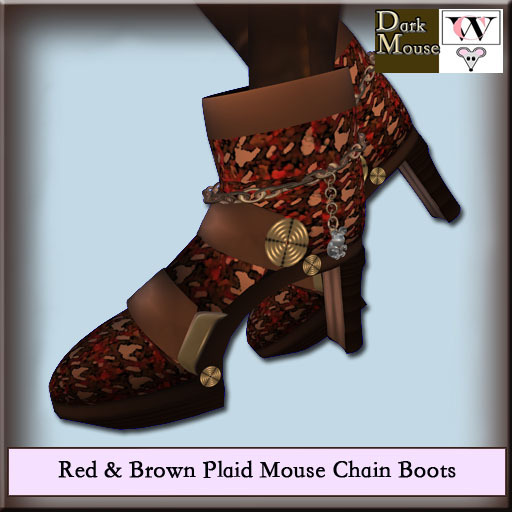 The brown buckle chunk sandal can be had in my shop for one week for only one linden! And finally, on the subject of change, I was sad to see that the Linden Lifestyles blog will be no more. When I first started playing SL®, it was the blog to read for fashion. I used to scan it daily, looking for where I should next spend my lindens. In many ways, it was responsible for my becoming a builder, as I realized I was going to need some money to start paying for my habit! Farewell Sabrina and Salome, you will be missed. Here are my new releases – teleport directly to the store by clicking on this link. Just get to the point, will you? What? Snarky is it? Yes I am! I have boots this week. Lovely, sharp, painful, cruel shoes! I had to make these I don’t care how many rounded toes there be in the world. 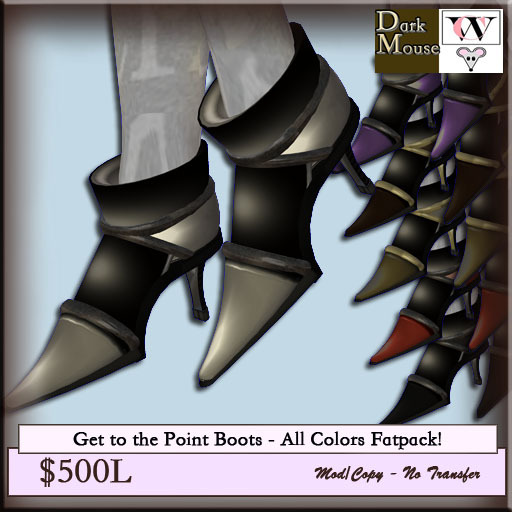 I made, ‘Get to the point Boots.” I decided to spare the feed and not post all colors, so stop by the store for a closeup! Six colors, a record for me – Gold, Silver, Brown, Black, Purple and Red (um if you’re a purple fiend, you want these boots). Come pick them up, my god a fat pack is only $500L! Oh I made a pretty cool necklace too. The ‘Charming Charm’ necklace. It’s got stuff on it. Charms basically. It’s a great piece. 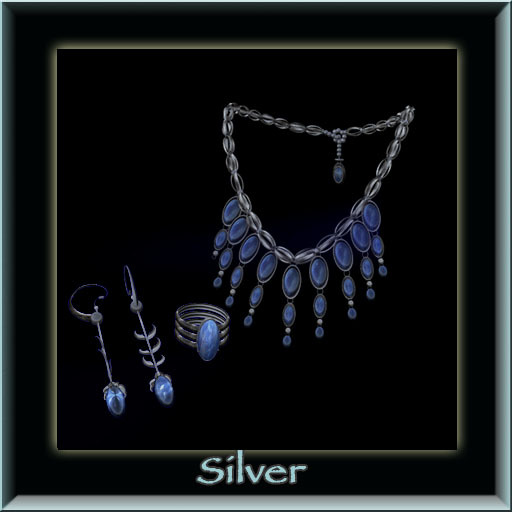 Oh and I made it in gold and silver, as I’ve been lagging in the silver department lately. Oh and I got sick of my freebies. I needed newness in the freebie department. Soooo I made a lovely pendant, the Fleur De Lis in Glass pendant. I likes it! Please stop by and take a look. 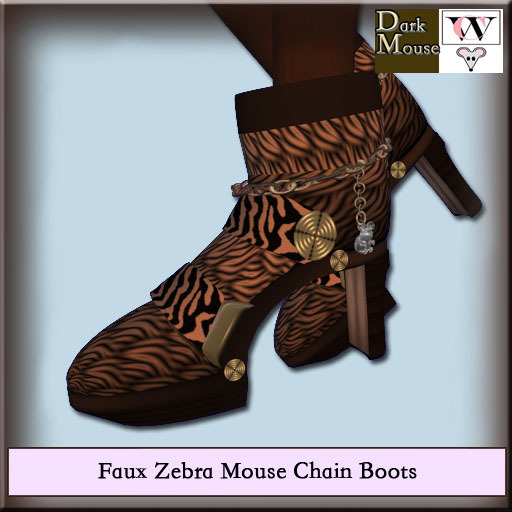 Here’s a slurl that will take you right to the store! So, I’m really, really tired. Been working waaaay too much, in RL and SL. Building stuff. Participating in mod-vends to get a deal on cool outfits, you know the whole routine. I’m scanning the feed and see Beanie Cannings post on W&Y Hair. I’m struggling with a necklace I’m making and think, just go take a look, the stupid necklace will still be here. Off I go. OMG – I got the absolute cutest, and I do mean cutest hair with cap style – well – speaks for itself. See below for credits and slurls!!! YAY! I finished rebuilding the store! More space for new stuff, better layout, shark with fricken laser beams in the bay – what more could one ask for! And, I must say, I love it. Came out really exactly as I envisioned. All good things! To celebrate, I’ll have a lovely gifty bag at the store, lots of fun stuff in there. This is in addition to the current crop of freebies that I normally give away! I have some great new releases this week for the grand re-opening. Boots! Yes, I made more. I must admit I’m frankly in a love/hate affair with shoes at the moment. It ain’t easy making shoes. But well, I cant’t resist, so I’ll just keep at it, tyvm. Pictures below, you may like them – some fun textures. Faux Patent Leather, brown leather, faux zebra and red plaid. They are, um different! 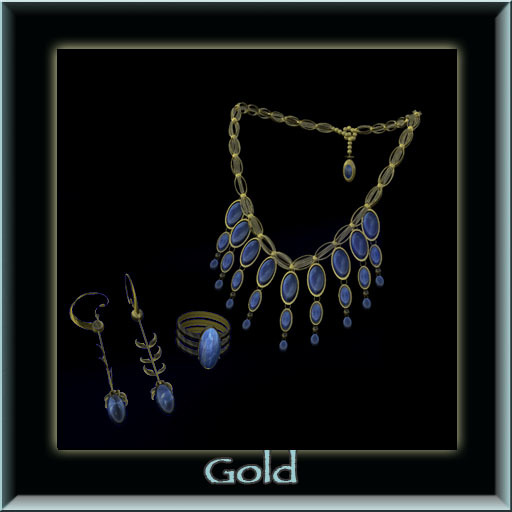 I also was inspired to do my own version of Andrew Grima’s jewelry. So I made the ‘Vintage Grima Set’ a huge ring, bracelets and necklace. I must say, quite cute, and quite the statement pieces. Stop by the store to check out the new build. Here’s a slurl directly to the store! I’ve also updated my SLexchange and ONrez stores. You can purchase all my stuff while you’re happily surfing at work. Not enough time in the day…. Okay, it’s official, I’ve taken on too much! Egad. Not only am I attempting to rebuild my store (OMG this will happen) but I’ve opened a new location at Bricolage, and now another, at Planet Mongo – I invite you to visit! Planet Mongo is a magnificent build, but low and behold, it will also be a shopping destination! New releases, I have a few ;-). At present they are only available at my main store in Taber and Bricolage locations. Oh and speaking of Bricolage, this is the only location where you’ll still discover my very popular ‘random sale’, to celebrate all those who are banned from anywhere – believe me, it’s for no good reason! It will officially end on July 6 at 5:00 p.m. SLT. Sooo, my new releases this week include an elegant triple strand of pearls with a matching pearl clasp on the back (look good from both directions!). The set comes in white or black pearls, and just for fun, and cool skull pearl. I also have some wooden bangles with painted flowers and a lovely pink and brown squishy sofa (as in comfy). I hope you enjoy the newness. Expect the main store to be closed next week at some point, as I take on the rebuild! You can use this link to teleport directly to Whimsical Creations!. When you’re in SL®, you can dress up as anything, be anything, wear anything. It’s your choice (erm unless you’re planning on attending SLB5 LOL). However, that said, there are days when you just feeling like being comfy. No complicated outfits or clothes. Nothing you have to match. I’m talking your go to clothing. Like all fashionistas, it is safe to say that I change my outfit in SL EVERYDAY. I am physically unable to accomplish ANYTHING until I’ve changed my outfit for the day! I also like typing in all caps to create EMPHASIS! Why you ask, am I doing a mashup post instead of rebuilding my shop? Why because I’m a major slug! I will say I have the prefabs completed and textured, and just a small tease here – I’m planning on selling these as prefab shops. I plan on doing a whole series. Plus my sale of $1L items is still going on, so can’t exactly take down the shop! Anywho – that all said, I have clothes and designers I consider my ‘go to’ clothing. Things I wear a lot because they are versatile and cool. Specifically, I really love anything from Pixeldolls. I’ve been busy lately with new builds, so not shopping so much. I had a $1000L giftcard from Pixeldolls burning a hole in my virtual pocket, so last night, off I went. I picked up these jeans which I think are an oldie but a goodie. I LOVE jeans that remind me of jeans I had as a teenager. I simply don’t know why but I do. For instance I’m absolutely in love with my Nyte and Day faded jeans, but I’ll save those for another post! The Pixeldoll jeans are the sort that you would buy new, with no fading and then wear for like a week straight to ‘wear’ them in and wash them 100 times till they fit you perfectly. I’m also wearing the new “Sloane” hair from Tousled, which is absolutely drool worthy, OMG the bobby pins, the bobby pins….My skin is as usual LF Chai, Trinity, the bright pink lipstick on this is amazing, the perfect tank top from Pushbutton Industries, and OF COURSE (insert shameless plug here), my own colorful bangles, beaded hoop earrings and mother of pearl belt. I’m finishing off the look with a tattoo from Garden of Ku, Day of the Hummingbird and the awesomeness of awesome sandals from *G Field*. I wear these sandals CONSTANTLY lol!